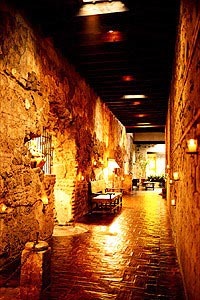 Casa Santo Domingo Hotel is a 350 year-old colonial monastery, magnificently converted into a grand five star hotel with 97 rooms, each with private bathroom. The entire hotel offers the visitor an unforgettable experience; everywhere one turns there is an authentic sample of 17th century art. Dine surrounded by the historical artifacts of a memorable past. In addition to the international restaurant, there is also a bar, swimming pool, several Jacuzzis, and business center with internet access. Amenities include cable television, telephone, minibar, in-room safe, coffeemaker, concierge services, currency exchange, and room service. Centrally located on a cobblestone street, Casa Santo Domingo Hotel is just a few steps away from Antigua's many shops and cafes. It is the ideal mix of romance, history, luxury and comfort.